Three years ago (or thereabouts), if you would've asked me about Acer tablets, my response would likely have been something similar to DeAndre Jordan's face after this nasty dunk over Brandon Knight back in 2013. Or, to put it a little more bluntly, there probably wouldn't have been anything positive to say. At all. The company has come a long way since then, and I feel like it has been offering especially good value for the money as of late, and the Iconia Tab 8 may be the crown jewel of its collection. 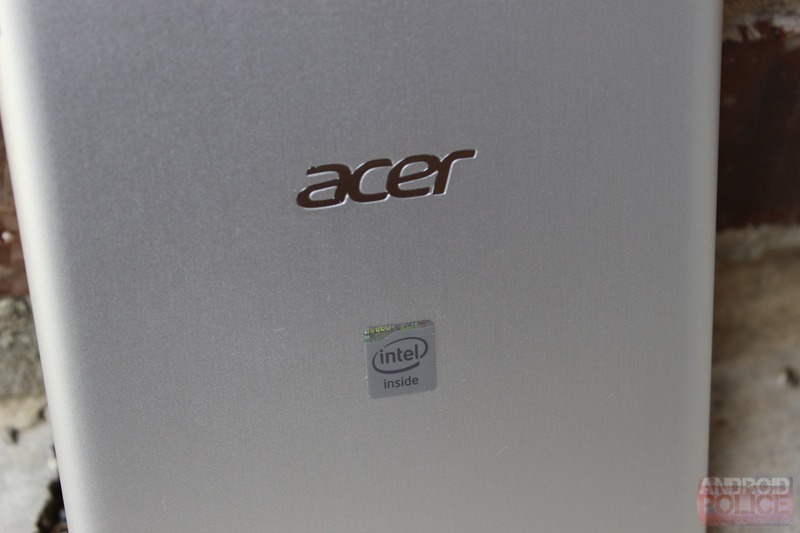 The weakest link in most of its predecessors was the display, which Acer has (finally) corrected on this go. Pair that with solid performance and a $200 price tag, and you have a winning tablet. Dimensions: 8.46 x 5.12 x 0.33 inches; 12.6 oz. 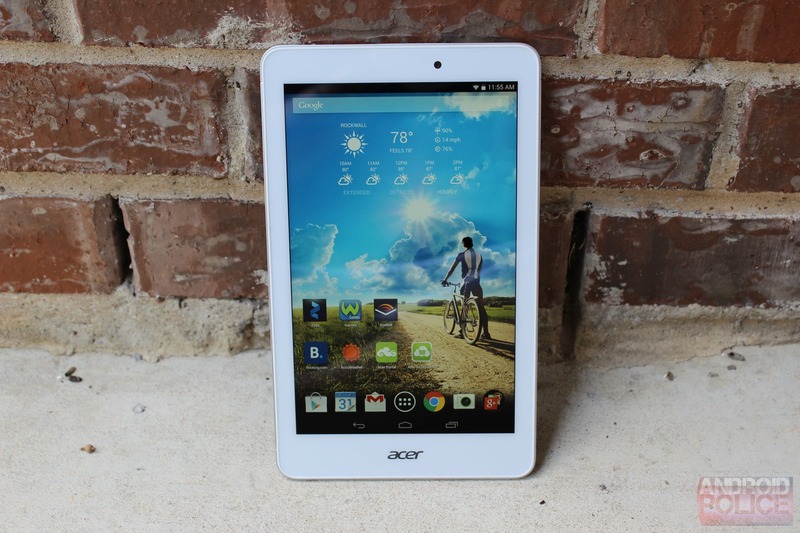 When it comes to Acer tablets, I've grown to have certain expectations. I never plan on being wowed by what I'll see, but I also don't expect to hate it, either. I'm basically always looking to see a middle-of-the-road device at a decent price point. 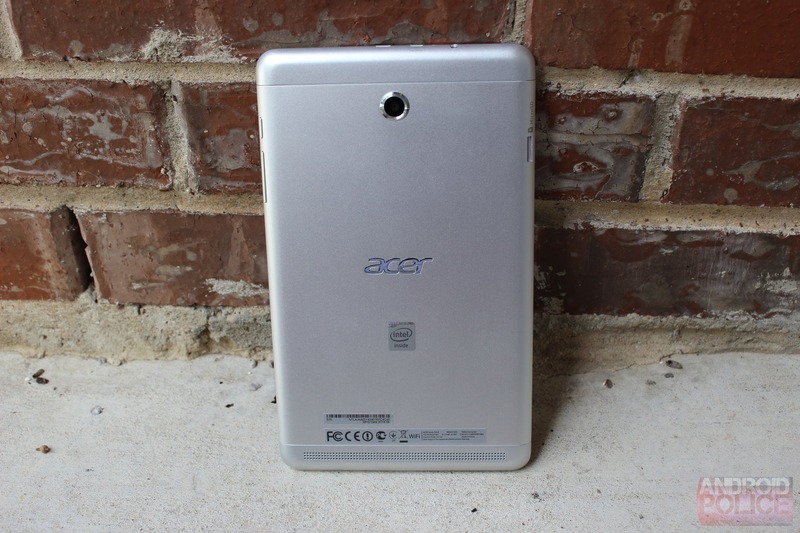 And that's exactly what the Iconia Tab 8 is, though it easily stands out in Acer's current catalog. 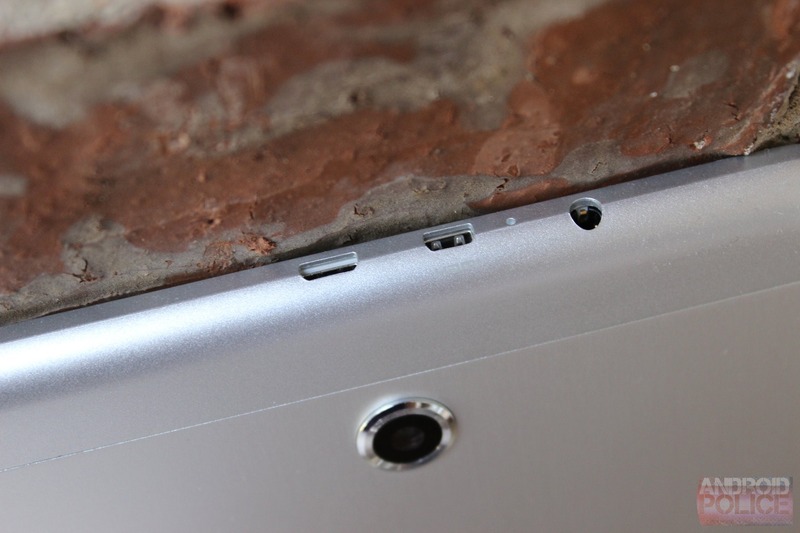 The build quality is good, and the hardware is on point without being amazing. It's a solid all-around little unit. The front of the device is clean and white, with a simple Acer logo at the bottom and camera at the top. 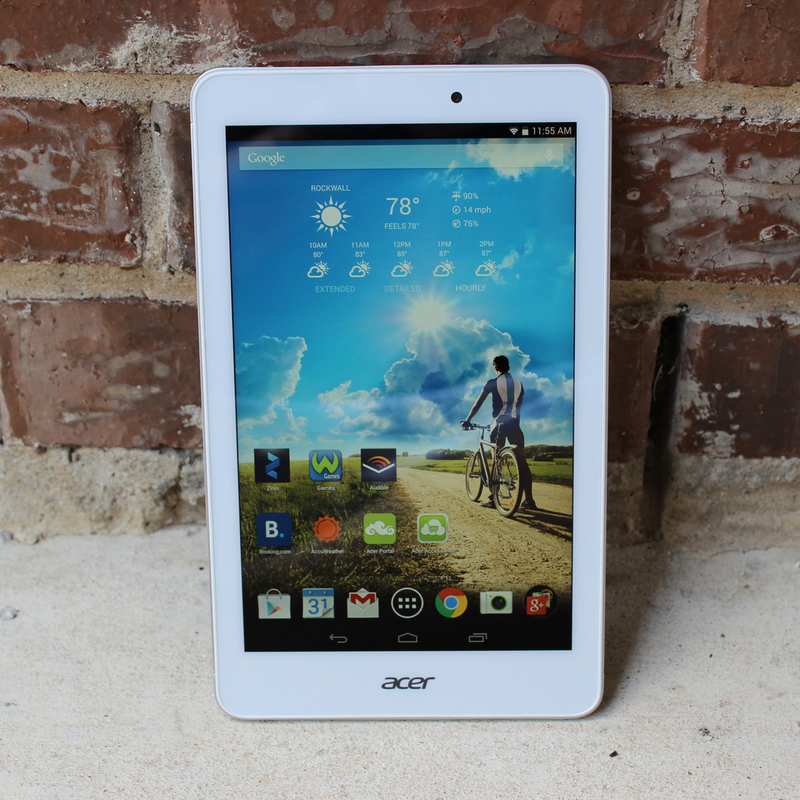 As with other Acer tablets, you won't find physical buttons here - everything is on screen. 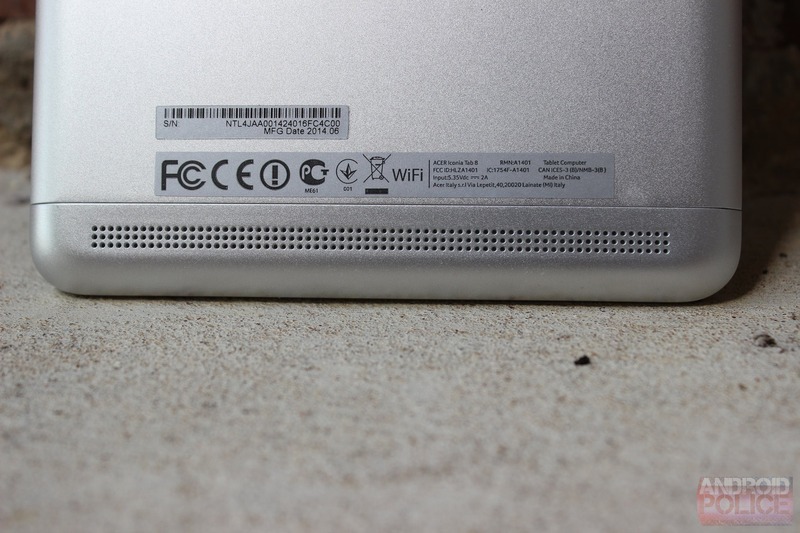 The back of the device is aluminum, which I personally don't like. Those who find aluminum's cold exterior pleasing to touch, however, will likely enjoy what Acer has done here. From what I can tell, only the larger, center section of the back is metal, whereas the small(ish) top and bottom caps are actually plastic. They blend in well enough, but there's still a distinct separation between the pieces, which takes away from what could potentially be an otherwise sleek exterior. The best feature of the IT8, however, is its display. For far too long Acer has cut corners when it comes to screens, but I'm happy to say that it decided to go with a much nicer panel on this tablet. 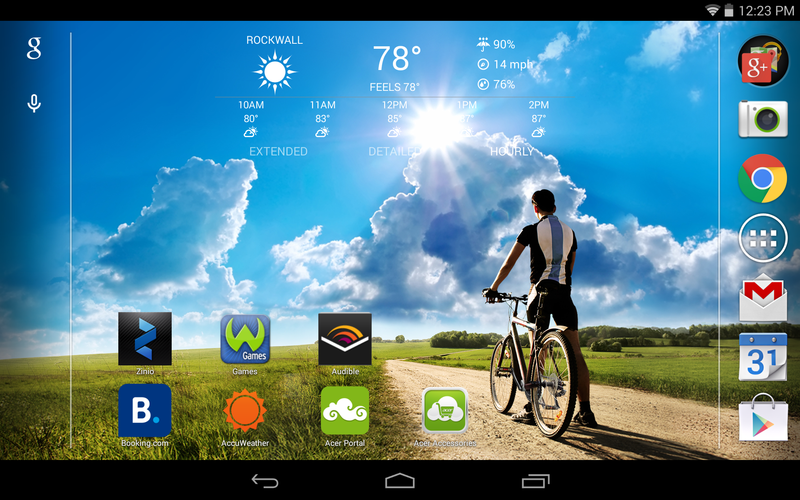 The 1920x1200 screen looks quite good – colors are well balanced and viewing angles are excellent. It's definitely a breath of fresh air to see a display of this quality on an Acer device. Otherwise, the IT8 delivers on most other things users will be looking for in this price point, save for the cameras, which are pretty awful. Outside of that, everything else is solid. 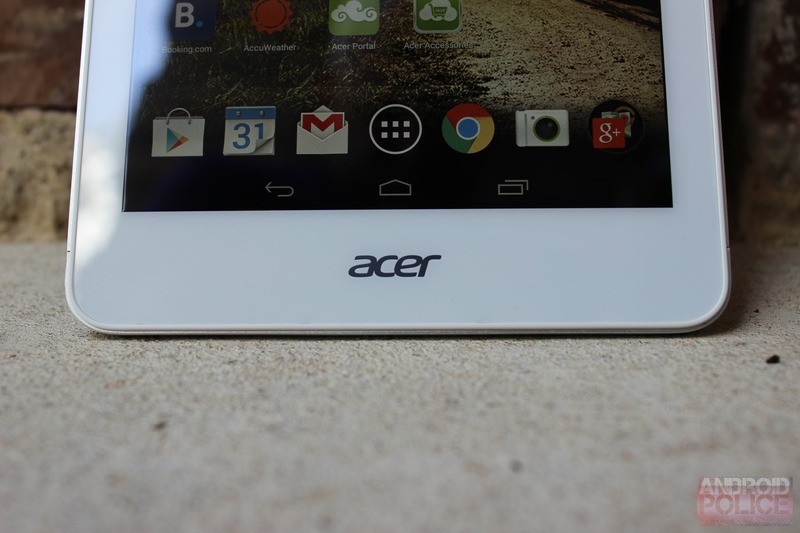 For the most part, Acer left stock Android untouched. It did, however, throw a few little tweaks in here and there, most of which I actually find kind of neat. Let's talk about those first. 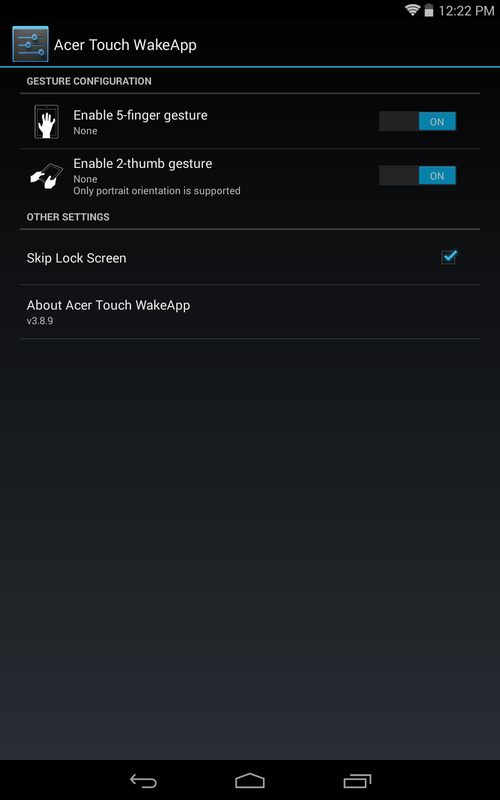 For starters, it's got an LG KnockON-esque feature called Touch WakeApp. 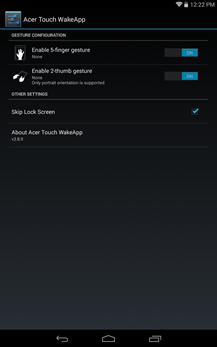 When enabled, this essentially allows the tablet to be turned on with a five-finger tap or two-thumb gesture (the latter of which only works in portrait mode) instead of using the traditional lockscreen. While it may not be the most powerful (or useful) utility, it's still kind of cool. Past that, it also has a really cool feature called IntelliSpin, which allows the tablet to detect rotation even when it's lying flat. 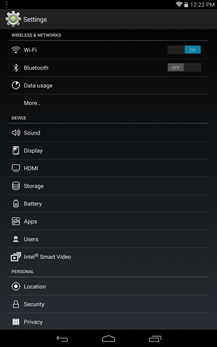 For example, if you put it on the tablet in portrait and then want to watch a video, simply spinning the tablet around will readjust the orientation as well. It's a simple fix to an annoying problem. Also, like all other Acer tablets, the volume rocker adjusts according to the orientation (which is something I can't believe stock Android doesn't do on its own). 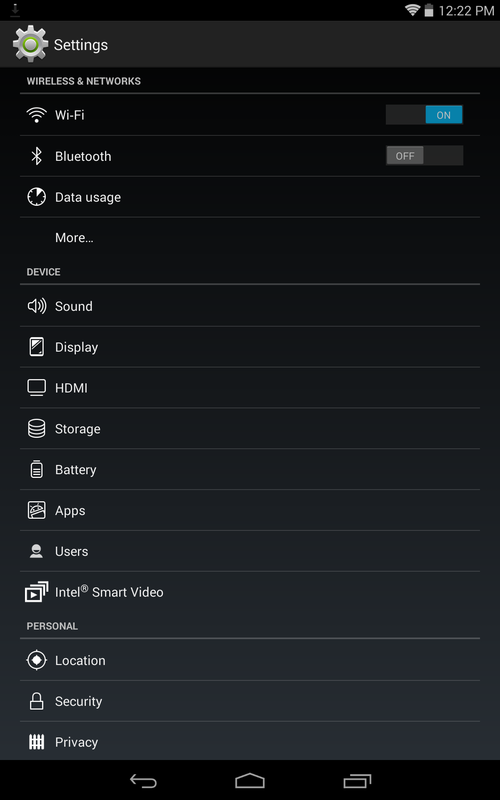 Otherwise, it's a pretty barebones Android system. Acer swapped out a few of the icons for its own take on how they should look, added a bit of color here and there, but pretty much left stuff alone. 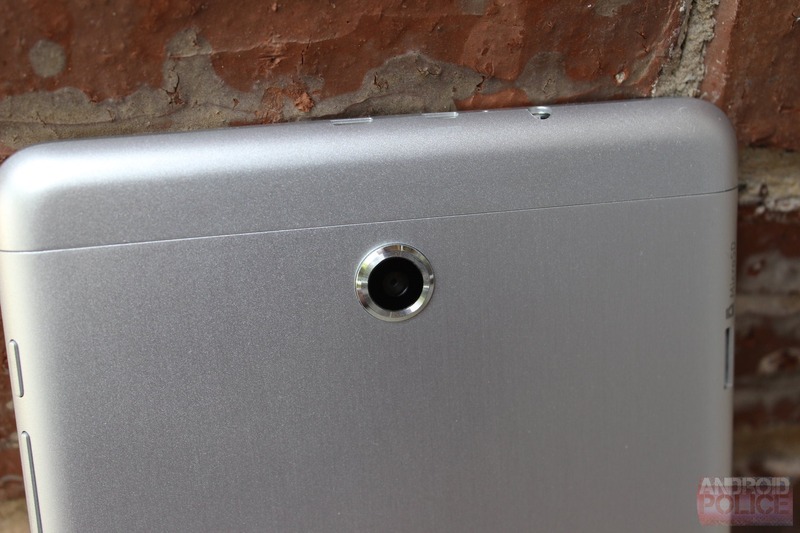 On the hardware side, the Iconia Tab 8 isn't what I'd call a powerhouse - but don't call it a creampuff, either. It's a solid performing device, and the quad-core Intel chip left me pretty impressed overall. At no point during my time with IT8 did it lag or slow, and for the most part, it kept up fine with all the things I normally use a tablet for. I was surprised by the Intel processor – it handled everything I threw at it without so much as a hiccup. It purred along nicely, launching apps and loading pages at a very consistent and non-frustrating pace. I wouldn't say it's the best for heavy gaming, but it handles lightweight games without issue. For gamers looking to pick up a tablet, I'd still recommend SHIELD Tablet, of course. At the end of it all, I'd say the Iconia Tab 8 is the best Acer tablet I've used to date. The build quality is good (albeit understated), the performance is incredibly smooth and consistent, and the display is very good. Pair that with Acer's subtle software tweaks like WakeApp and IntelliSpin, and this is an excellent device for the money. Unfortunately, the biggest potential downside is one that's yet to be seen: how Acer will handle future updates. The company hasn't done what I'd call an exemplary job of keeping its devices on the latest version of Android up to this point, and I fear that the IT8 will suffer the same fate. With Android L just around the corner and no promise of an OTA, it makes buying this unit a gamble. That said, if future version compatibility isn't something that you're concerned with (say, if considering this as a gift for someone else who may not be concerned with OTAs), then fire away. 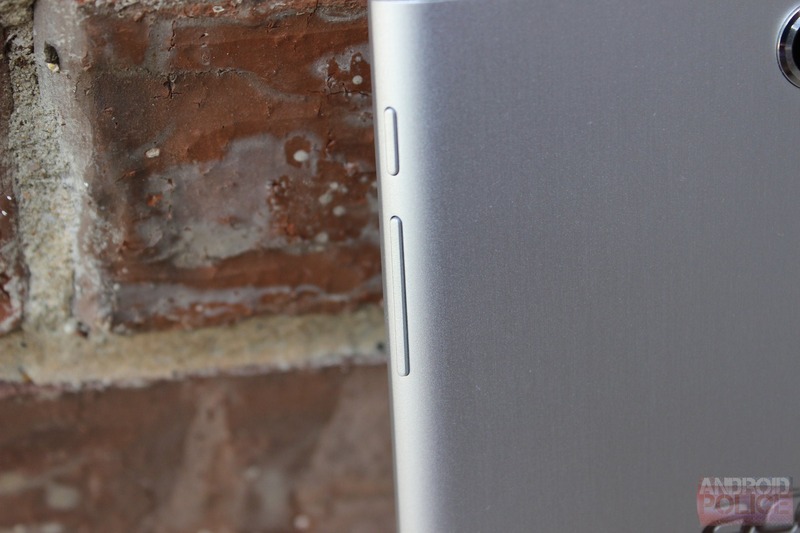 At this price, it's almost impossible to ignore everything the Iconia Tab 8 has to offer.